Flamed back and sides, good spruce top, golden-broown shading. Better flamed wood, choice spruce top, golden-yellow shaded and slightly imitated. Seasoned curly maple for back and sides, choice spruce top, dark amber varnish, fine trimmings. 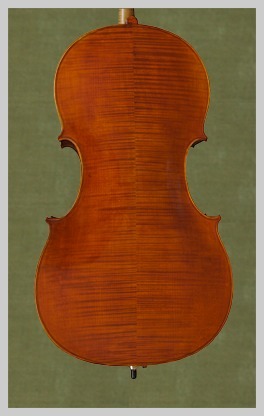 Stradivarius or Guarnerius model, well flamed maple for back and sides, best spruce top, fine reddish-brown imitation of old, high quality ebony trimmings.